School of Data is inviting journalists, civil society advocates and anyone interested in pushing data literacy forward to apply for its 2017 Fellowship and Data Expert Programmes, which will run from April to December 2017. Up to 10 positions are open, with an application deadline set on Sunday, April 2nd of 2017. OK, let's go! WHAT IS A SCHOOL OF DATA EXPERT? Concretely, the Data Expert will have to help a local organisation develop a data project and become more data literate. That will mean understanding the strengths and weaknesses of the organisation in regard to data use, working closely with their staff on designing and developing the data project and lastly training this staff. At School of Data, we recruit data experts on an annual basis, and provide them with data and leadership training as well as coaching on how to best design long term data support for an organisation. Data experts will become part of a growing global network of School of Data practitioners, benefiting from the network effects of sharing resources and knowledge and contributing to our understanding of how best to localise our training efforts. 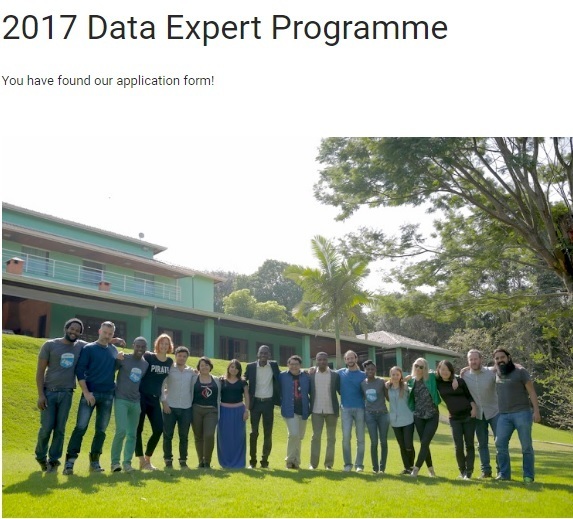 2017 will be the first cycle of our Data Expert Programme. Our pilot projects showed that this programme has the potential of being transformative for organizations that are already doing a great job, but need your help to do more. We will be recruiting 2 Data Expert positions in 2017, one in Kampala, Uganda and one in Dar es Salaam, Tanzania. They will work up to 10 days a month from April to December on data projects related to the extractives industry. Our international partner, the National Resource Governance Institute, will assist the 2 Data Experts in learning about the intricacies of extractives data. IMPORTANT: the Ugandan programme requires an expert with good GIS knowledge and skills. Both programmes require good data skills, including scraping, cleaning, analysing and visualising data. A final point: we are committed to being inclusive in its recruitment practices. Inclusiveness means excluding no one because of race, age, religion, cultural appearance, sexual orientation, ethnicity or gender. We proactively seek to recruit individuals who differ from one another in these characteristics, in the belief that diversity enriches all that we do. This application will be open until Sunday, April 2nd, 12AM GMT+0.